The TBWA Hakuhodo ad agency wanted their office to communicate something to both its employees and clients: “we think differently”. TBWA Hakuhodo teamed up with Klein Dytham Architecture to give form to this message, creating one of the most beautiful, playful and relaxing office environments in the world. Klein Dytham selected the location within an amusement complex in downtown Tokyo. Once a bowling alley itself, the office’s building still operates a bowling alley, a golf driving range and other entertainment functions above and below the office. 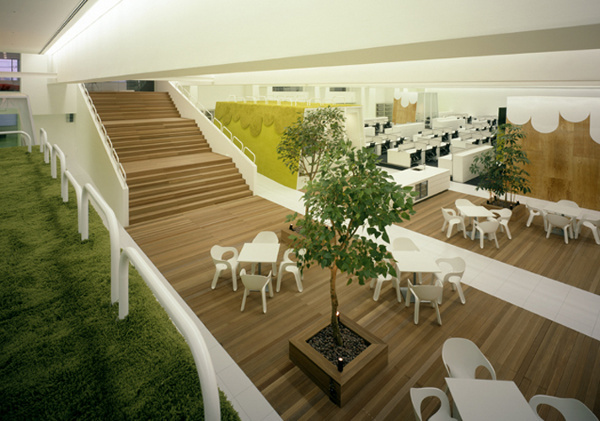 The office itself is just as fun as anything else in the building, a tree and grass-lined environment with warm hardwood floors, indirect lighting and an open space that promotes casual living and community.